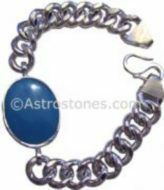 We bring you yet another unique and very effective product, which is a combination of Vedic Astrology and Numerology, known as Navratna Bangle. Each gemstone is associated with a specific planet for maximum benefits and effects. Unlike Navratna Pendant this special Bangel has got 3.0 carats EACH of very high-quality gemstones, all of them are proven to be very effective and powerful! The Navratna Bangel gives benefits of all the 9 planets to the user. Coupled with this customer gets a lucky number embedded in the Bangel, which is unique to that person. The number is derived from the date of birth of the person or his/her birth name. The Bangel is available in Silver and Gold. The nine gemstones are set along the square border of Bangel with the customer’s unique lucky number in the centre. Most of the Mughal Emperors and their wives use to wear them as a “must have” lucky charm. Navratna is one of the most famous, effective and widely used selections of Gemstones in one Bangel. It works all year around to protect and enhances your chances of luck as it has got NINE real Gemstones from nine Planets. It is well-known fact that if anyone wears his or her Numerological Lucky Number (see below how to get yours) gets a lot of benefits like protection from evil forces, negative energies, and negative thoughts and brings a lot of luck and fortune.